An azeotrope is a mixture of two or more liquid substances in such a ratio that the composition of the mixture is not changed by simple distillation. 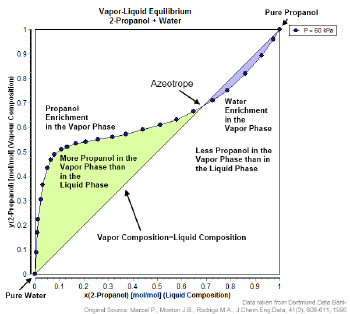 In other words, when an azeotrope is boiled, the resultant vapor has the same ratio of constituents as the original mixture. For this reason, azeotropes are also called (especially in older texts) constant boiling mixtures. A common example of an azeotrope is a mixture consisting of 95.6 percent ethanol and 4.4 percent water (by weight), which boils at the constant temperature of 78.1 °C. In some cases, two liquids may be nearly immiscible but, when their mixture is boiled, their vapor consists of a fixed ratio of the two and coexists with the two liquid phases. Such a mixture is called a heteroazeotrope. Combinations of solvents that do not form an azeotrope when mixed in any proportion are said to be zeotropic. When performing the distillation of a mixture of solvents, it is often helpful to know the azeotropic composition of the mixture. Also, when a chemical process produces two or more waste solvents, it may be important to collect the solvents in separate containers, to prevent the formation of azeotropes and to make it easier to recycle the solvents. An azeotrope of acetonitrile, methanol, and water is used for the analytical technique known as high pressure liquid chromatography (HPLC). More than 18,000 azeotropic mixtures have been documented, each with a characteristic boiling point. If the boiling point of an azeotrope is lower than that of any of its constituents, it is called a positive azeotrope, and if it is higher than that of any of its constituents, it is called a negative azeotrope. A well-known example of a positive azeotrope is 95.6 percent ethanol and 4.4 percent water (by weight). Ethanol boils at 78.4°C, water boils at 100°C, but the azeotrope boils at 78.1°C, which is lower than either of its constituents. Indeed 78.1°C is the minimum temperature at which any ethanol/water solution can boil. In general, a positive azeotrope boils at a lower temperature than any other ratio of its constituents. Positive azeotropes are also called minimum boiling mixtures. An example of a negative azeotrope is a mixture of 20.2 percent hydrogen chloride and 79.8 percent water (by weight). Hydrogen chloride boils at –84°C and water at 100°C, but the azeotrope boils at 110°C, which is higher than the boiling point of either of its constituents. The maximum temperature at which any hydrochloric acid solution can boil is 110°C. In general, a negative azeotrope boils at a higher temperature than any other ratio of its constituents. Negative azeotropes are also called maximum boiling mixtures. Azeotropes consisting of two constituents, as in the above examples, are called binary azeotropes. Those consisting of three constituents are called ternary azeotropes. Azeotropes of more than three constituents are also known. If two solvents can form a positive azeotrope, then distillation of any mixture of those constituents will result in the distillate being closer in composition to the azeotrope than the starting mixture. For example, if a 50/50 mixture of ethanol and water is distilled once, the distillate will be 80 percent ethanol and 20 percent water (see ethanol data page), which is closer to the azeotropic mixture than the original. Distilling the 80/20 mixture produces a distillate that is 87 percent ethanol and 13 percent water. Further repeated distillations will produce mixtures that are progressively closer to the azeotropic ratio of 95.5/4.5. No number of distillations, however, will ever result in a distillate that exceeds the azeotropic ratio. Likewise when distilling a mixture of ethanol and water that is richer in ethanol than the azeotrope, the distillate (contrary to intuition) will be poorer in ethanol than the original but slightly richer than the azeotrope. If two solvents can form a negative azeotrope, then distillation of any mixture of those constituents will result in the residue being closer in composition to the azeotrope than the original mixture. For example, if a hydrochloric acid solution contains less than 20.2 percent hydrogen chloride, boiling the mixture will leave behind a solution that is richer in hydrogen chloride than the original. If the solution initially contains more than 20.2 percent hydrogen chloride, then boiling will leave behind a solution that is poorer in hydrogen chloride than the original. Boiling of any hydrochloric acid solution long enough will cause the solution left behind to approach the azeotropic ratio. The boiling and recondensation of a mixture of two solvents are changes of state. As such, they are best illustrated with a phase diagram. If pressure is held constant, the two parameters that can vary are the temperature and the composition. An azeotrope is not the same as an emulsion. The diagram on the right shows a positive azeotrope of hypothetical constituents, X and Y. The bottom trace illustrates the boiling temperature of various compositions. Below the bottom trace, only the liquid phase is in equilibrium. The top trace illustrates the vapor composition above the liquid at a given temperature. Above the top trace, only the vapor is in equilibrium. 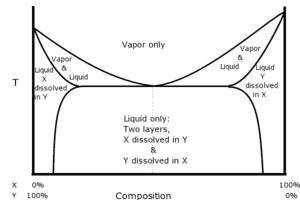 Between the two traces, liquid and vapor phases exist simultaneously in equilibrium: For example, heating a 25 percent X : 75 percent Y mixture to temperature AB would generate vapor of composition B over liquid of composition A. The azeotrope is the point on the diagram where the two curves touch. The horizontal and vertical steps show the path of repeated distillations. Point A is the boiling point of a nonazeotropic mixture. The vapor that separates at that temperature has composition B. The shape of the curves requires that the vapor at B be richer in constituent X than the liquid at point A. The vapor is physically separated from the VLE (vapor-liquid equilibrium) system and is cooled to point C, where it condenses. The resulting liquid (point C) is now richer in X than it was at point A. If the collected liquid is boiled again, it progresses to point D, and so on. The stepwise progression shows how repeated distillation can never produce a distillate that is richer in constituent X than the azeotrope. Note that starting to the right of the azeotrope point results in the same stepwise process closing in on the azeotrope point from the other direction. 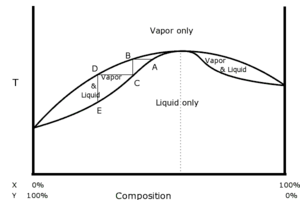 The traces in the phase diagrams separate whenever the composition of the vapor differs from the composition of the liquid at the same temperature. Suppose the total composition were 50/50. One could make this composition using 50 percent of 50/50 vapor and 50 percent of 50/50 liquid, but one could also make it from 83.33 percent of 45/55 vapor and 16.67 percent of 75/25 liquid, as well as from many other combinations. The separation of the two traces represents the range of combinations of liquid and vapor that can make each total composition. Alternatively, one can view the lower trace as the boundary for the region of the diagram in which liquids are in equilibrium, and the upper trace as the boundary of the region in which the vapor is in equilibrium. These two boundaries need not coincide. Indeed, the region between them is a no-man's-land: attempts to bring the system to the midpoint of line-segment AB will result in a mixture of liquid A and vapor B, but nothing at the midpoint. In each of the examples discussed so far, the constituents have been miscible in all proportions with each other. For example, any amount of ethanol can be mixed with any amount of water to form a homogeneous solution. In some cases, a pair of liquids may be mostly immiscible, but when boiled, the vapor consists of a fixed ratio of the two liquids. If the azeotrope is such that the vapor phase coexists with two liquid phases, it is called a heteroazeotrope. For example, if equal volumes of chloroform (water solubility 0.8 g/100 ml at 20°C) and water are shaken together and then left to stand, the liquid will separate into two layers. Analysis of the layers shows that the top layer is mostly water with a small amount of chloroform dissolved in it, and the bottom layer is mostly chloroform with a small amount of water dissolved in it. If the two layers are heated together, the system of layers will boil at 53.3°C, which is lower than the boiling point of chloroform (61.2°C) and that of water (100°C). The vapor will consist of 97.0 percent chloroform and 3.0 percent water regardless of the how much of each liquid layer is present (provided both layers are indeed present). If the vapor is recondensed, the layers will reform in the condensate, and will do so in a fixed ratio, which in this case is 4.4 percent of the volume in the top layer and 95.6 percent in the bottom layer. The diagram illustrates how the various phases of a heteroazeotrope are related. 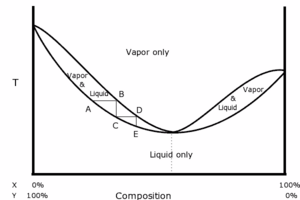 Total vapor pressure of mixtures as a function of composition at a chosen constant temperature. Distillation is one of the primary tools that chemists and chemical engineers use to separate mixtures into their constituents. Because distillation cannot separate the constituents of an azeotrope, the separation of azeotropic mixtures (also called azeotrope breaking) is a topic of considerable interest. Indeed this difficulty led some early investigators to believe that azeotropes were actually compounds of their constituents. But there are two reasons for believing that this is not the case. One is that the molar ratio of the constituents of an azeotrope is not generally the ratio of small integers. For example, the azeotrope formed by water and acetonitrile contains 2.253 moles of acetonitrile for each mole of water. A more compelling reason for believing that azeotropes are not compounds is, as discussed in the last section, that the composition of an azeotrope can be affected by pressure. Contrast that with a true compound, carbon dioxide for example, which is two moles of oxygen for each mole of carbon no matter what pressure the gas is observed at. 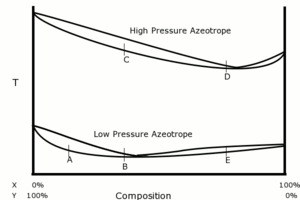 That azeotropic composition can be affected by pressure suggests a means by which such a mixture can be separated. A mixture of 5 percent water with 95 percent tetrahydrofuran is an example of an azeotrope that can be economically separated using a pressure swing—a swing in this case between 1 atm and 8 atm. By contrast the composition of the water/ethanol azeotrope discussed earlier is not affected enough by pressure to be easily separated using pressure swings. Other methods of separation involve introducing an additional agent, called an entrainer, that will affect the volatility of one of the azeotrope constituents more than another. When an entrainer is added to a binary azeotrope to form a ternary azeotrope, and the resulting mixture distilled, the method is called azeotropic distillation. The best known example is adding benzene or cyclohexane to the water/ethanol azeotrope. With cyclohexane as the entrainer, the ternary azeotrope is 7 percent water, 17 percent ethanol, and 76 percent cyclohexane, and boils at 62.1°C. Just enough cyclohexane is added to the water/ethanol azeotrope to engage all of the water into the ternary azeotrope. When the mixture is then boiled, the azeotrope vaporizes leaving a residue composed almost entirely of the excess ethanol. A more extreme example is the azeotrope of 1.2 percent water with 98.8 percent diethyl ether. Ether holds the last bit of water so tenaciously that only a very powerful desiccant such as sodium metal added to the liquid phase can result in completely dry ether. When a salt is dissolved in a solvent, it always has the effect of raising the boiling point of that solvent—that is it decreases the volatility of the solvent. When the salt is readily soluble in one constituent of a mixture but not in another, the volatility of the constituent in which it is soluble is decreased and the other constituent is unaffected. In this way, for example, it is possible to break the water/ethanol azeotrope by dissolving potassium acetate in it and distilling the result. Extractive distillation is similar to azeotropic distillation, except in this case the entrainer is less volatile than any of the azeotrope's constituents. For example, the azeotrope of 20 percent acetone with 80 percent chloroform can be broken by adding water and distilling the result. The water forms a separate layer in which the acetone preferentially dissolves. The result is that the distillate is richer in chloroform than the original azeotrope. Sometimes azeotropes are useful in separating zeotropic mixtures. An example is a mixture of acetic acid and water, which do not form an azeotrope. Despite this it is very difficult to separate pure acetic acid (boiling point: 118.1°C) from a solution of acetic acid and water by distillation alone. As progressive distillations produce solutions with less and less water, each further distillation becomes less effective at removing the remaining water. Distilling the solution to dry acetic acid is therefore economically impractical. But ethyl acetate forms an azeotrope with water that boils at 70.4°C. By adding ethyl acetate as an entrainer, it is possible to distill away the azeotrope and leave nearly pure acetic acid as the residue. 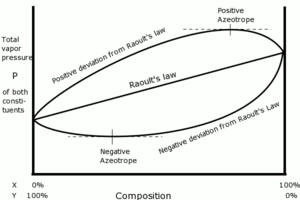 As already discussed, azeotropes can only form when a mixture deviates from Raoult's law. Raoult's law applies when the molecules of the constituents stick to each other to the same degree as they do to themselves. For example, if the constituents are X and Y, then X sticks to Y with roughly equal energy as X does with X and Y does with Y. A positive deviation from Raoult's law results when the constituents have a disaffinity for each other—that is X sticks to X and Y to Y better than X sticks to Y. Because this results in the mixture having less total sticking together of the molecules than the pure constituents, they more readily escape from the stuck-together phase, which is to say the liquid phase, and into the vapor phase. When X sticks to Y more aggressively than X does to X and Y does to Y, the result is a negative deviation from Raoult's law. In this case because there is more sticking together of the molecules in the mixture than in the pure constituents, they are more reluctant to escape the stuck-together liquid phase. 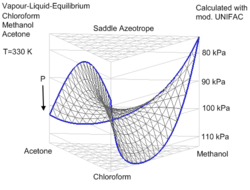 Saddle azeotropic system Methanol/Acetone/Chloroform calculated with mod. UNIFAC. The rules for positive and negative azeotropes apply to all the examples discussed so far. But there are some examples that don't fit into the categories of positive or negative azeotropes. The best known of these is the ternary azeotrope formed by 30 percent acetone, 47 percent chloroform, and 23 percent methanol, which boils at 57.5°C. Each pair of these constituents forms a binary azeotrope, but chloroform/methanol and acetone/methanol both form positive azeotropes while chloroform/acetone forms a negative azeotrope. The resulting ternary azeotrope is neither positive nor negative. Its boiling point falls between the boiling points of acetone and chloroform, so it is neither a maximum nor a minimum boiling point. This type of system is called a saddle azeotrope. Only systems of three or more constituents can form saddle azeotropes. 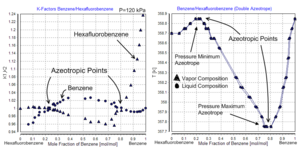 A rare type of complex binary azeotrope is one where the boiling point and condensation point curves touch at two points in the phase diagram. Such a system is called a double azeotrope, which will have two azeotropic compositions and boiling points. An example is water and N-methylethylenediamine. Double azeotrope of benzene and hexafluorobenzene. Taken from Dortmund Data Bank. Some examples of azeotropes are given below. Proportions are by weight. [[Acetonitrile (44 percent) / methanol (52 percent) / water, boils at 65-70 °C, used for HPLC analyses. ↑ 1.0 1.1 1.2 1.3 1.4 1.5 1.6 1.7 1.8 1.9 Eva-Katrine Hilmen, Separation of Azeotropic Mixtures: Tools for Analysis and Studies on Batch Distillation Operation, Norwegian University of Science and Technology, Department of Chemical Engineering. Retrieved January 28, 2019. ↑ Robert Thornton Morrison and Robert Neilson Boyd, Organic Chemistry, 6th ed. (Englewood Cliffs, NJ: Prentice Hall, 1992, ISBN 978-0136436690), 508. ↑ Martha Windholz, Merck Index of Chemicals and Drugs, 9th ed. (Rahway, NJ: Merck, ISBN 978-0911910261). ↑ 4.0 4.1 4.2 4.3 Walter J. Moore, Physical Chemistry, 4th ed. (Englewood Cliffs, NJ: Prentice-Hall, 1972). ↑ David R. Lide, CRC Handbook of Chemistry and Physics, 74th edition (Boca Raton, FL: CRC Press, 1993, ISBN 978-0849304743), 2156. ↑ 6.0 6.1 Jim Clark, Nonideal Mixtures of Liquids Chemguide. Retrieved January 28, 2019. ↑ Jack Ponton, Azeotrope Databank The Edinburgh Collection of Open Software for Simulation and Education, Edinburgh University. Retrieved January 28, 2019. ↑ 9.0 9.1 Julius B. Cohen, Practical Organic Chemistry (London, UK: MacMillan, 1946). ↑ Solvent Recycling, What is an azeotrope? B/R Corporation. Retrieved January 28, 2019. Cohen, Julius B. Practical Organic Chemistry. London, UK: MacMillan, 1946. Lide, David R. CRC Handbook of Chemistry and Physics, 74th edition. Boca Raton, FL: CRC Press, 1993. ISBN 978-0849304743. Moore, Walter J. Physical Chemistry, 4th ed. Englewood Cliffs, NJ: Prentice-Hall, 1972. ISBN 978-0136659686. Morrison, Robert Thornton, and Robert Neilson Boyd. Organic Chemistry, 6th ed. Englewood Cliffs, NJ: Prentice Hall, 1992. ISBN 978-0136436690. Windholz, Martha. Merck Index of Chemicals and Drugs, 9th ed. Rahway, NJ: Merck, 1976. ISBN 978-0911910261. All links retrieved January 24, 2019. What is an Azeotrope? B/R Corporation.